When it comes to travel, I've long held the theory that great restaurants and pubs find you -- and not the other way around. Sure, I use guide books -- and the recommendations of friends and hotel staff -- but time and time again, I'm drawn instead to the joint next door, across the street, around the corner or a block over. They rarely disappoint. * Plancius: Named, I'm thinking, after the 16th century astronomer/cartographer/clergyman Petrus Plancius (no, I'm not a genius -- it was the first hit I got when I googled "Plancius"), we visited this hip spot mid-afternoon our first day in Amsterdam. It's next door to the Dutch Resistance Museum (very cool, btw) and across from Amsterdam's zoo. Meal-wise, we were a little scribbled -- Matt had scrambled eggs and a beer. I had a Thai curry soup -- and a beer. We decided we liked cool green walls, industrial concrete floors and the fact that they allowed dogs -- very big dogs -- inside. * De Prins: Walking into De Prins is like meeting up with an old, old friend. The minute you walk into this lovely old canal house, located on the Prinsengracht (canal) across from the Anne Frank House, the cafe wraps its arms around you, pulls you over to a wooden table, makes you sit down, then slowly says, "It's SO good to see you." And like that old, old friend -- De Prins has a few surprises: A menu that that covers everything from sturdy homemade soups to wild boar chops with Calvados, chestnut mashed potatoes and Elzasser sauerkraut. Tucked away in a dark,, comfy corner in the back of the restaurant, Matt and I went for the sturdy soup option -- split pea (a Dutch specialty--and we can vouch for that) and goulash. And beer. It was a good way to remember, and release, the shadowy, heartbreaking memories that haunt Anne Frank House. * Sama Sebo: This Indonesian treasure, Sama Sebo, found my husband and me when we visited Amsterdam in 2002. It was our first time in Europe, and we were travelling with a group of five friends. Traveling in a pack is hard in Europe as Brad and I quickly discovered. We ultimately decided to divide and conquer, striking out on our own during the day and meeting up with the troops for a glass of wine, and the telling of tales, in the early evening. We were were on our way back from the Van Gogh Museum for such a session when we spied a minitiature door to a restaurant. A compellingly small door. A door that insisted we open it. Inside was an small enclosed foyer -- and a beautiful teenage Indonesian girl doing what appeared to be quantum physics. We asked about dinner. She disappeared behind a closed door and returned a few seconds later, followed by a small man in a batik dinner jacket and fabulously spikey black hair. He gravely guided us into an intimate dining room where we were set upon by at least 12 different waiters, also decked out in batik dinner jackets, apparently each personally responsible for our complete and total happiness. One glass of wine later, we were tucking into one of the best meals I've ever eaten -- a rijstaffel (rice table) -- or series of Indonesian small plates served with exquisite timing and precision. We were completely, and totally, happy. And so were Matt and I on Thanksgiving night as we recreated that glorious meal. Sama Sebo delivered. Totally satiated, we walked back to the hotel. And decided, thanks to utter contentment and internal alarm clocks still set on Bermtopian time, we weren't quite ready for bed. A Thanksgiving night cap was in order -- and we found it at Van Vuyter's, a tidy little bistro around the corner from our hotel. VV is the kind of place where you settle in with a beer or glass of wine and spend hours solving the problems of the world, telling funny family stories and pondering life's mysteries. We accomplished all three, then toddled back to The Citadel. * Panorama: The comes a time in your travels when you need carbs -- thank God for Panorama. Friday's itinerary was ambitious: A walk to the Albert Cuyp Market in the morning, then to the Van Gogh Museum in the afternoon. Then a canal stroll. Did I mention the market is about a mile long? You get the picture -- we were on our feet most of the day, and when dinnertime rolled around, we were feeling a bit peckish. And a little lost as to where to eat. So we started to walk. Again. As luck would have it, Panorama was just around the corner from hotel on the other side of Singel canal. 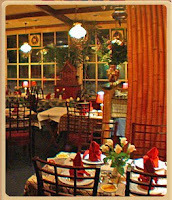 We were drawn to the the little bistro like lemmings to the sea -- and we when walked into the restaurant, it felt right. It was small, maybe 10-12 tables. It was dark and cozy. The menu was Italian. All pasta. Beauty. I don't eat a lot of pasta, but at Panorama, I laser-locked onto the spaghetti carbonara and never looked back. It was probably the best pasta dish I've eaten. I think Matt shared similar sentiments about his bolognese. We didn't suffer. Thank God Panorama found us. And Plancius. And De Prins. And Sama Sebo. And the handful of other little pubs and bistros we popped into for a beer, bowl of soup or snack. Bon appetit, Amsterdam!